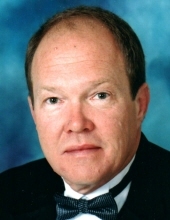 Earnest Stephen Bradley of Knoxville, TN, age sixty-four, passed January 9th, 2019. Whether you were his friend, family, or otherwise, Steve's charismatic personality left a lasting impression. Often seen enjoying a good cigar, dinner with friends, or traveling with family, Steve was known by those close to him as a man who loved fiercely. His devotion to his children and granddaughters was unmatched. His ultimate love, however, was his closest friend, confidant, comforter, and constant companion of forty-four years, Gail. The world has lost a great man, but we take comfort in knowing that he is happily reunited with his loved ones who passed on before him. Steve is preceded in death by his parents: Ernest Bradley and Vonnie Wood Bradley, and his brother-in-law, David Rankin. Continuing to cherish his memory are: wife, Gail Sharits Bradley; son, Stephen Bradley, former daughter-in-law, Jennifer Roberts Bradley; granddaughter, Rebecca Addison Bradley; daughter and son-in-law, Stephanie Bradley Vinson and Ed Vinson; granddaughter Madaline Sofia Nico Bradley; brother, William "Frank" Bradley and sister-in-law, Paula Bradley; sister, Deborah Rankin; sister and brother-in-law Brenda and Maurice Williams; and many loved nieces and nephews. The celebration of life will be Tuesday, January 15th at Click Funeral Home Middlebrook Chapel. A gathering of friends and family will take place from 5- to 7 p.m., followed by a celebration of life beginning at 7 p.m. In lieu of flowers, please consider a donation in his honor to East TN Kidney Foundation. Click Funeral Home, 9020 Middlebrook Pike is serving the Bradley family. To send flowers or a remembrance gift to the family of Earnest Stephen Bradley, please visit our Tribute Store. "Email Address" would like to share the life celebration of Earnest Stephen Bradley. Click on the "link" to go to share a favorite memory or leave a condolence message for the family.